Dude, you did WHAT in your sock? Blizzard has slammed the unhealthy practise of 'poopsocking'- the act of neglecting basic hygiene in favour of remaining at your PC. Following the UK mainstream media's rush to cover the unfortunate story of a young World Of Warcraft gamer collapsing after a lengthy session on Blizzard's massively popular MMO, TechRadar spoke to PC Zone to get their take on the matter. 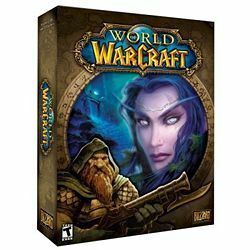 "The problem with World of Warcraft is that its developer, Blizzard, has had four years now to refine and perfect a set of game rules which promotes addiction," said Deputy Editor of PC Zone, Steve Hogarty. Though Hogarty is quick to add the disclaimer,"though it's cynical to think that the creators of WoW are happy with children and adults wasting away in front of their game." "In fact, when PC Zone confronted lead game designer Tom Chilton with the phenomenon of 'poopsocking', he was stunned, saying "no, no... I highly encourage players to use the restroom..."!" The 15-year-old Swedish boy in question had been caning the new Wrath of the Lich King expansion pack for 24 hours solid, suffering an epileptic-like fit after the day-long stint at the monitor. "They played all day and all night. Maybe they got a few hours of sleep. They ate a little food and breakfast at their computers," the boy's father told the Kvällsposten newspaper in Sweden. Doctors put the boy's seizure down to sleep deprivation, lack of food, and a prolonged period of concentration on the game. Dr Richard Graham, a child psychiatrist at the Tavistock Centre, told the BBC: "Some of my clients will discuss playing games for 14 to 16 hours a day at times without breaks and for those the consequences are potentially very severe." "The problem with World of Warcraft is the degree it can impact and create a socially withdrawn figure who may be connecting with people in the game and is largely dropping out of education, social opportunities." Surely though, two of the more obvious questions seemingly going unanswered here are "why would you allow your child to play a game for 24 hours straight?" and "how many, of the ELEVEN MILLION plus WoW players could be classified as being 'addicted' to the game?"